At last, it is done. Oh my word I am so loving this wall treatment in my little boy’s room! 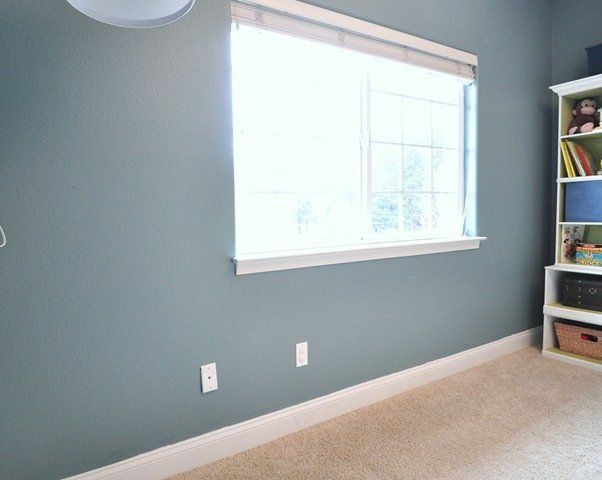 I’ve always loved the paint color (Valspar’s ‘La Fonda Villa Fountain’), yet somehow this wall treatment not only mellows all the intense teal blue but also provides such beautiful contrast. Heart! I know there are so many ‘how to’ tutorials in blog land about board and batten, and truly they are all worth reading. Everyone has a different approach. I installed this same wall treatment last month in my friend Mia’s loft, and finally had the opportunity to install board and batten around an entire bedroom in our house. Pay no attention to the variance in color from scene to scene you’re about to see. These pictures were taken in the brightest morning light and under the dimmest incandescent light over the course of several weeks ~ basically whenever I could get around to working on this project. Want to know how we did it? I’ll tell ya! This is the section under the window, but (duh) I never captured it at any other angle. You’ll have to wait for the room reveal to see this wall, but I have more ‘final’ pics of the other walls at the end, just scroll down. But first, the play by play. One of the first things anyone must think about when installing board and batten is the baseboards. Depending on how thick your battens (the vertical strips) are, they will overhang most existing baseboard. What to do? Well, you can roll with it and let them extend out beyond the baseboard, or you can replace your baseboard. This time, I did something in between. I reused my existing baseboard, but I trimmed them to accommodate the battens. 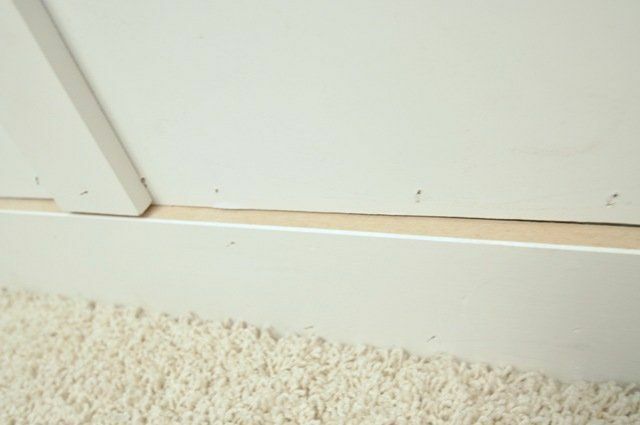 The existing baseboard is ½ inch thick but it had a decorative lip or trim on top. It came to me in the middle of the night, why I didn’t need to replace my baseboard, I could just repurpose it if I trimmed it! I decided to cut out that top decorative trim with my Dremel MultiMax. It worked great, but it was really slow. And I kept having to stop to recharge my battery. I’m an impatient gal in these circumstances, so instead I popped off the baseboards and simply ran them through a table saw, borrowed from a friend. Here’s a peek at what they looked like after we ripped them on the table saw. The same baseboards, just trimmed. Look how those battens line up perfectly now! Plenty of people don’t bother with paneling the lower half of the wall when installing board and batten. I’m cool with that. If you have smooth walls, there is no need. But as I recently explained, this room has orange peel textured walls, and that just wasn’t going to fly with me. 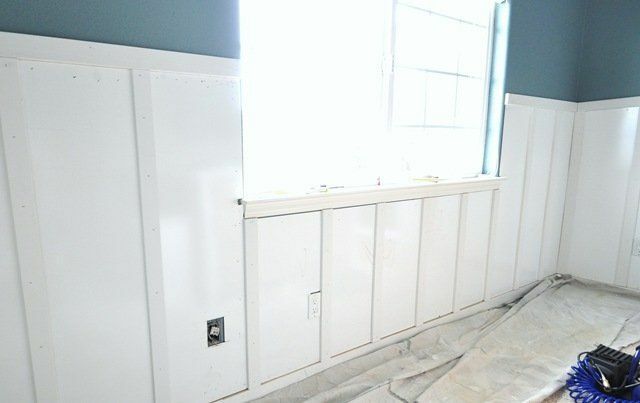 When we added wainscoting to our living room, we used 4’ x 8’ dry erase boards from Lowes to panel the bottom part of the wall (no kidding), and we did it again in this room. 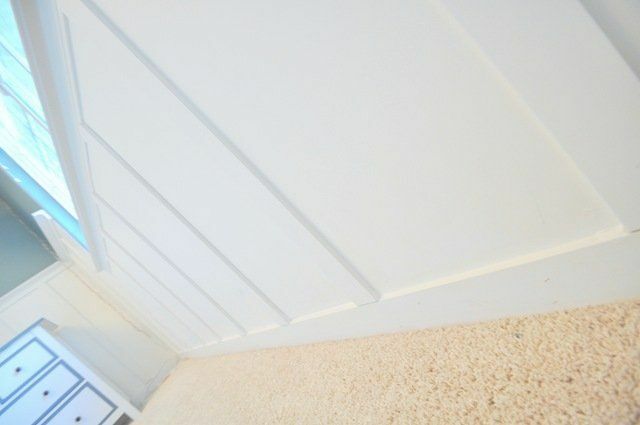 These panels are 1/8” thick; thin enough to set on top of the baseboards, but perfect for covering texture and providing a smooth surface below. And they only cost $12 bucks each, yo. My local Lowes also carries tongue & groove panels and beadboard panels in 4’ x 8’ sheets, so if you prefer that style of paneling, look for it in the lumber department. You have to notch out wherever the electrical sockets are on the lower sections of your wall. Again, the Dremel MultiMax comes in handy, but in the past we’ve used a jig saw too. A really sharp box cutter will work as well. 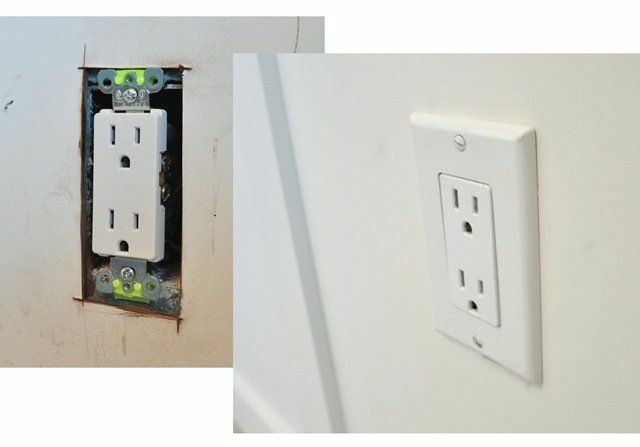 Always use outlet spacers (as with any paneling like beadboard, tongue and groove, etc.) to extend your sockets, and consult an electrician if necessary. Apply some construction adhesive to the back of your panel . . . .
. . . then use a brad nailer to attach the panels to the wall. Pa bang! Pa bang! Pa bang! 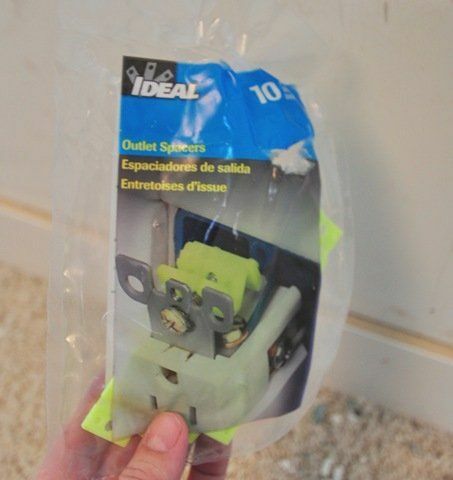 If you measure precisely, your cutout will be covered by your socket plate. Notice those sassy spacers to the left, bringing florescent back! 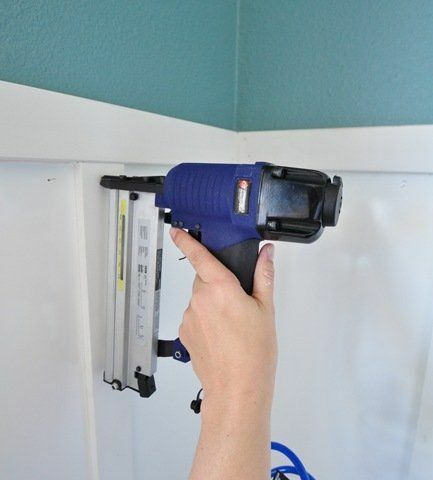 Above the paneling, we installed a 2 ½” thick horizontal rail with our finish nailer, then cut the 2” pre-primed MDF battens to fit underneath, attaching them with the brad nailer. If you don’t own a brad nailer, don’t sweat it. You do not need one to complete this project. You can use good old fashioned hammer and nails, it will just take you a bit longer. You can see in this picture how the boards truly are dry erase boards, I let the kids doodle on them for a just a day. And I managed to repair those holes too. Above the paneling is the 2 ½” rail, then below are the 2” battens, cut to the proper height with a compound miter saw, and spaced 12” apart. I like to fill seams with caulking and patch holes with spackling. 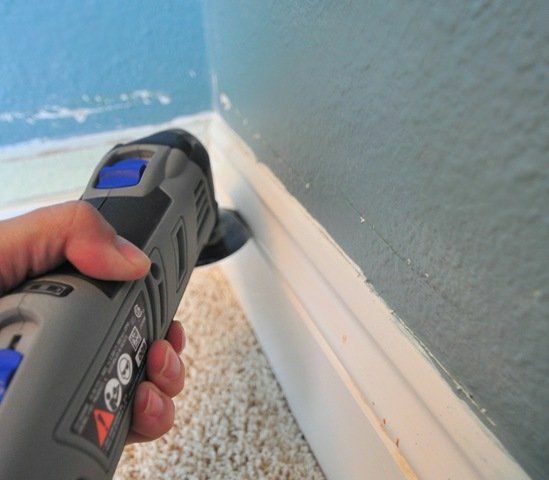 Caulking will shrink, so you might have to apply it more than once. I always keep a wet rag handy because caulking is paintable, but not sandable, so make sure you wipe it off any surface where you don’t want it to dry. Brad and finish nail holes are easily patched with spackling. The pre-primed MDF rails and battens don’t need primer, but the dry erase board panels do. Be sure to use a primer that will adhere to slick or glossy surfaces! 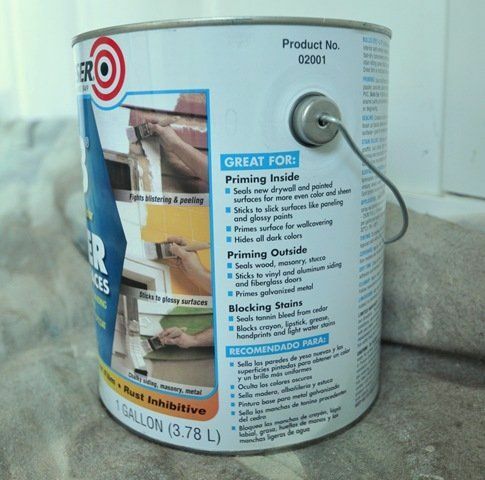 In this case, I choose Zinsser’s Bulls Eye 123 Primer (Water Based) in the blue can. Then I finished it all off with a coat of Benjamin Moore’s ‘Dove White’. 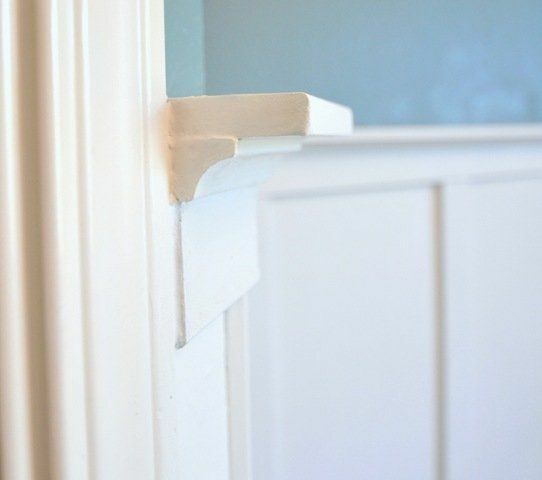 As a final note, we also installed a small shelf above the rail with cove molding ~ I explain the installation in greater detail in this post on basic board and batten. If you opt for any shelf above your board and batten wall treatment, study where it will end as it wraps around the room. Naturally it will stick out if it ends on a window or a door frame so be prepared for that! I’m not too worried about it. I see greater value in the display space, since my boy will be using his ledge to hoist his sails . . . If you want to see the full room tour with the board and batten fully complete, check out this boy’s room tour! What about you? 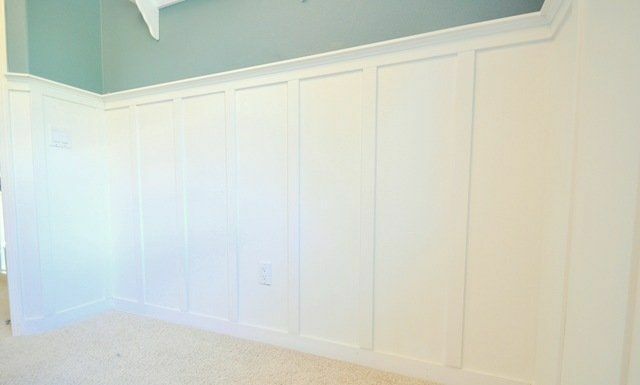 Have you installed any board and batten or wainscoting in your home? Got any tips or tricks you’d like to share ? I also love how it mellowed out the color of the room and is such a lovely contrast! Looks GREAT! Crisp and clean and fresh. I am considering doing this in my hall, so thanks for the tutorial. Did I miss who won the nailer/stapler? I LOVE IT! So cute! You are so handy…I wish you were my sister or next door neighbor (sigh!) Anyway, I have one quick question. 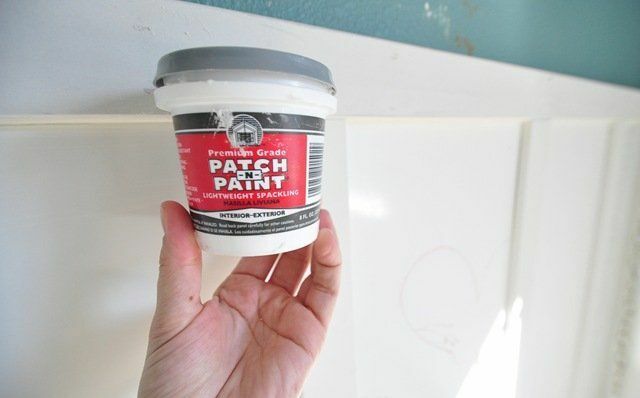 You mentioned that you used boards because of the orange peel finish on your walls…IF someone (like me:) has smooth dry walled walls can you do batten and just paint your existing walls white? As you can tell I’ve NEVER done this before but I am dreaming up some BIG changes for my back hallway that is attached to my BIG laundry room and has the door leading in from the garage. No mudroom, so I am trying to figure out how to use the wall space and remove the laundry room door (big change but I never close it anyway and it takes up SO much room!) and do board & batten all along one wall. Just wondering if the board was necessary with smooth walls. (You’re probably laughing and shaking your head at my ignorance…my husband does the same thing…:) Anyway, enjoy your little boy’s room…it’s adorable! I am going to be installing this in my bathroom makeover and I’m so glad you included so many photos of the process. I love to have something to refer back to when I get discouraged during the construction ! It looks so crisp and clean, love it! Rock that Dremel girl! Looks great! Looks nice. I like the shelf idea. I’m sure it will be where action figures save the day and throw their enemies to their deaths. Can you tell I have a six year old boy ? That looks AMAZING. And I love that you used dry erase boards. Brilliant. 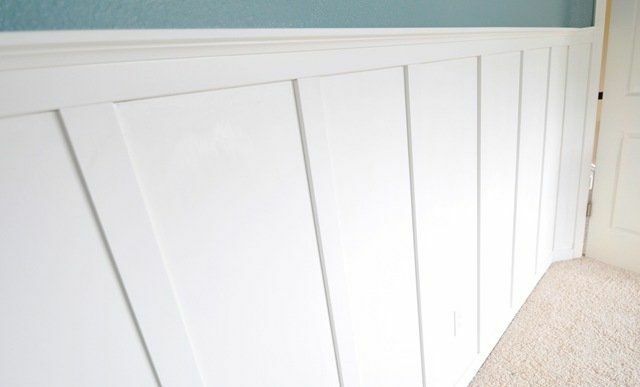 I followed your board and batten tutorial and just finished my mud room (I think I mentioned that to you the other day…I totally gave you credit – I think there were three links to your blog in that post). It was one wall which was a good place to start. I would LOVE to do my son’s room. Now just to convince my husband that it’s a great idea. I hope you get a chance to stop by and see my board and batten. The mudroom reveal is today’s post. Your son’s room came out amazing. I really can’t wait to see you reveal the entire room. Our builder added all the trims to the wall directly, then painted everything from the chair rail down white. No Panel, but I don’t have orange peel walls to deal with. Thanks for the panel tip though!! Gorgeous! That display shelf is going to be awesome, too! What a great project, all of the details you wrote really help me to understand how it works. 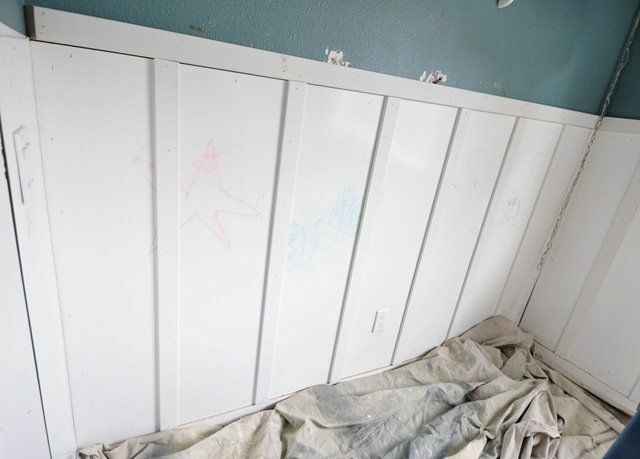 At first I thought you were going to tell us you left the dry erase panels so your little ones could write on them, did you ever think of doing that? Kind of like chalkboard fun only white. How resourceful with the dry erase board! We have trim treatments throughout our house. Love the board and batten with shelf. Oddly enough, we have it in our boy’s room, too. Love the look! Great work! I love the blue and the white. This DIY project turned out great. I have been thinking about doing this in my living room. Thanks for all the steps. I would have never thought to use dry erase boards. Brilliant! Oh you tease!!! I can’t wait to see the whole room all finished! That’s pretty awesome that you used dry erase boards for this project! Bookmarked! Stop by my blog to enter my giveaway for a $25 to Real Milk Paints.. maybe you need some paint to complete a project ;) ? Great tutorial and clear photos. 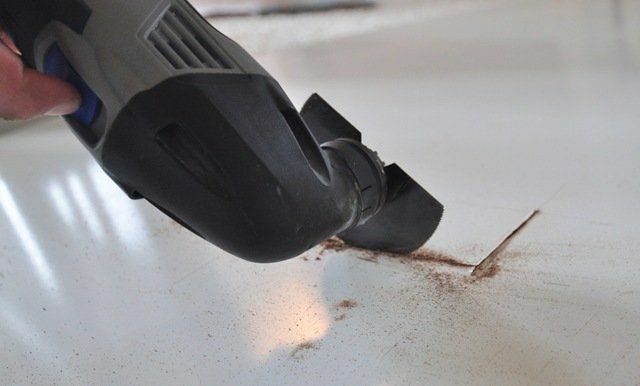 Trimming and reusing the baseboard – what a great idea! Thank you. Awesome!!! Can’t wait to see the whole room!!! I have been contemplating doing B&B in my basement and now I’m sold on the idea!!! Fantastic!!! Wow, the room looks great! Can’t wait to see the room put together. You guys did a fab job! It looks amazing! I did board and batten in our bedroom and love it. i love it. it looks so cute. when i have a home and a family i’m totally going to do this kind of treatment. i’ve just always thought it looks super classy. Go YOU! It looks fabulous and I absolutely adore board and batten! We have put it in our laundry room and on of our hallways, with an area in our basement that we still need to finish. One thing that we did to deal with the battens not matching up with the baseboards exactly, was to cut them at a 45 degree angle so that they “taper” and blend in a little more. I love it. Thanks for sharing – can’t wait to see everything put together. It makes the room look so bright and crisp. LOVE. Oh wow! Looks amazing. I love b&b!!!! Dry erase boards??? Oh my, that’s such a cool solution! You seriously come up with the best stuff. Looking forward to seeing the finished product! Oh wow! I am really impressed by what a great job you did! Definitely looking forward to the finished product! 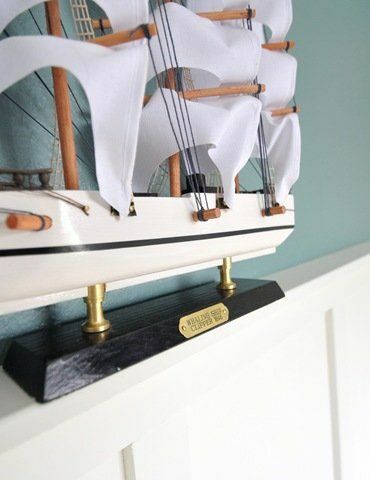 :) Really loved the boat model. This is definitely something we will be doing in our nursery! I just love how yours turned out! This makes me want to do my laundry room! It’s in desperate need of an overhaul. Great job! Great tutorial, Kate. Thanks for showing the close-up of how you did the baseboards. That was one thing I’ve missed in a couple of other posts I’ve seen online. His room looks fabulous! It looks great Kate! Thanks for the tutorial. I’d love to try this in a room somewhere down the road. Dry erase boards? Daaamn girl, you are a genius!! I love it! Love the blue also! Wow, that truly gave me an idea for a room that needs exactly that!! May have to go on back burner for now…too many other projects and that would be a huge one for me!! Kate, I love your blog, you are so inspiring! Just recently started my own blog and would love your feedback! only a few posts! We just installed some in our entry and up our stair case and I absolutely love it! I posted about it here: http://imperfectlypolished.com/2011/03/01/board-and-batten-part-2/. Yours is much more detailed than ours:) Great job! Could you elaborate on the “dry erase board” situation? How does that work? Does it dent easily? How well does the paint stick…I am intrigued to say the least. Ready to do board and batten in my dining room and may go this route…I NEED CONVINCING! wow! what a transformation! it looks great. isn’t doing home renovations yourself so gratifying (and at times, frustrating)?! cute blog – i’m enjoying my visit! I came up with this idea for our living room with the picture frame wainscot and it worked, but it works even better with board & batten because you can hide the seams with a batten instead of caulk. The sheets are 8 feet long so they will cover much of your wall, set them on top of the baseboard, no joke. They’re not flimsy and they don’t bend at all, you have to use a sharp blade to penetrate them. Go to Lowes and find them, I’m telling you, you wont believe how easy this is! Measure the widths you need before you buty and have them cut there in the lumber department. You do need to prime them with a primer that will stick to glossy surfaces, so pick up that Zinsser in the blue can. For reals!!! We did bead-board in our guest room 3/4’s up the wall. We put a little ledge at the top too. On the ends that ended at door or window molding I rounded the corner by placing a glass on the edge, marking the radius and cutting it off with a saw, then sanding to smooth it out. It really looks cute and I have enough space on the ledge to lean pictures, place my angel figurines, etc. Love the B&B treatment. I may try to talk My Handyman into doing it in our Master BR, but not sure I can convince him. CG–how long did it take you from start to finish? I’d really like to do B&B in our home, but it seems to take us forever to do a task. Maybe I can convince DH if it’s not too time intensive. LOVE the room and the tips. Great! Amazingly gorgeous!!! It’s just so pretty. And that blue color is great! Um…very embarassed…while showing hubby your very cool project, I found the paragraph about not needing to use board if you have smooth walls…please disregard my previous comment and go have a glass of wine…you’ve earned it!! I didn’t even know the term…so this is new to me. I love the look, can’t wait to see the completed room. Kathy, you are BRILLANT! I love that idea, I think I’ll try that out! Colleen ~ Cutting the boards takes the longest time. We had the guys in the lumber department make all the vertical cuts for each portion of the wall. Notching each socket takes a few minutes too. I’d allow yourself at least 4-5 hours for that process. Cutting the battens takes about 45 minutes to an hour, but installing them goes very quickly if you have a brad or finish nailer. Caulking and spackling takes another hour. Priming and painting another hour each. Total for this 10 x 13 room: 9-10 hours, so it’s doable in a weekend! Love the transformation… gotta love a classic board & batten! What an inspiration you are! I read your blog and am so inspired, if somewhat intimidated, by your projects. I appreciate your careful instructions and comments on what products to use. One day, perhaps, I’ll make the leap and do something in my own house. Thanks for posting. The whiteboards are a fantastic idea! Do you find that the paint holds up well on such a glossy surface to start? I admire your tenacity to start and FINISH a project! It looks lovely! Thank you for all the wonderful tips and for sharing the name of that beautiful wall color! I’m excited to do a B&B project of my own! Wow! Inspiring-and an awesome tutorial- Thanks! Ummm, no, Kate, I don’t have any tips to share because your fabulosity faaaar outshines my own. :) I learn something new everyday at CG. It looks fantastic! Can’t wait to see the finished room. Looks great, Kate! We have board and batten in the kids’ playroom and I love it. It was totally worth all the time it took to paint all those strips and hang them and paint them again. Congrats Kate! I will be placing my order for your services this week – can you make it down in May :) But honestly, beautiful job and I am loving the blue color! Absolutely amazing! I cannot wait to see it all finished! Kate, it looks awesome! Can’t wait to see the final pics…I know it will be fabulous! Thank you so much for your thorough tutorials. Thanks to your dining room project we are tackling our dining room this weekend. You have lots of helpful hints to complete it. One thing i thought i would mention is that we ended up buying plain, unprimed mdf sheets with a glossy finish. Since yours needed to be primed too you might want to look into those- they are about 50% less per sheet than the dry erase boards. Thank you again though, we absolutely could not have done this project without some of your great tips- i.e. the spacers, etc! looks fab! cant wait til spring temps rise–i call it “spray painting season”–I have plans to do wainscoting in my dining room…after I repaint my 1991 orange oak kitchen cabinets (and secretly repaint the kitchen a vivid orchid color…dont tell hubby!)! Was the Benjamin Moore paint you used a semi gloss, or flat finish paint? It doesn’t look too glossy in your pics, but I couldn’t tell for sure. Looking good! I can hardly wait for the full reveal. Julia, another brilliant solution! For some reason, my local Lowes doesn’t carry those so I opted for the DE boards, but good for others to know, and saves some cash too, thanks! Aimee, the paint is eggshell, not flat or glossy, my favorite sheen to use in a bedroom. i loooove this. if i could convince my fiance, i’d have this in every room in my house. ;) jk that might be a little overkill but i definitely need at least a room or two. Looks wonderful! Beautiful job, Kate! 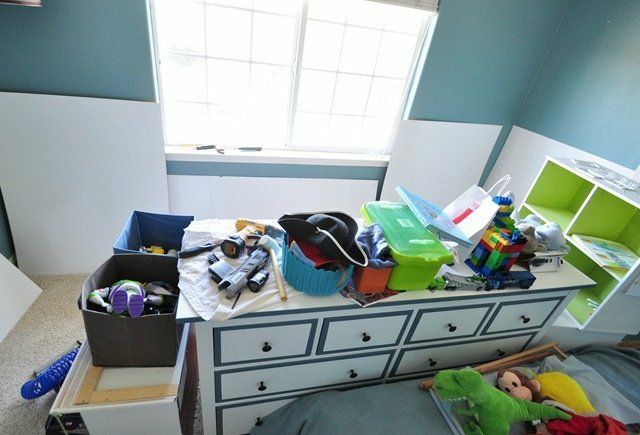 Are the bookcases in your son’s room standard that you added moulding to? If so, how easy is this to do? I’d love to replicate this in my daughter’s room. We have two store bought bookcases in pink that are stacked on top of each other and just need to be “jazzed up”. You are amazing! That looks great! Love it! We just finished a large project like this in our bedroom and I am now about to paint it. Can you tell me what method you use to get a smooth finish with the paint, i.e., brush, roller (if so, what nap), sprayer, etc.? I want as smooth of finish as possible with the least amount of work :) Great job…love your blog!! I have a quick question regarding the DE boards—do they paint well? Or did you not have to paint them? The people at my Lowes said they wouldn’t paint, the paint would just scratch off. Have you found this to the case? In the same general theme of Edna, I was wondering about the spacing of the battens. Where do you start?? It seems they will not be even with all windows on ends, or into all of the corners. There are always doorways and windows to contend with and my room is not an even dimension. I absolutely love this look! I was considering it for my master bedroom, but I’m not sure if I could handle all that caulking. We recently did our laundry room from floor to ceiling in bead board with a LOT of trim and it took abut 4 big tubes of that Dap. 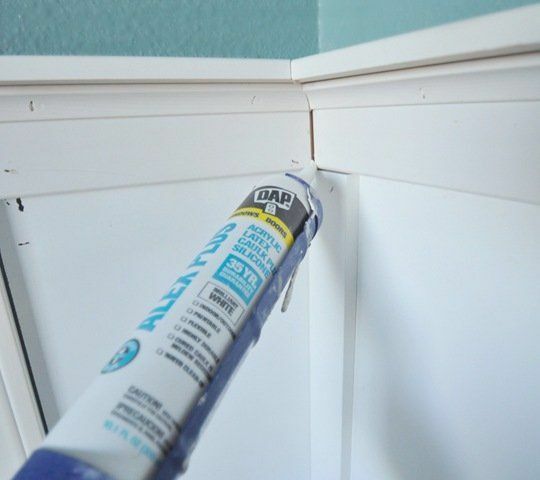 Did you caulk all the seams – even on all the vertical sides of the battens? Love your board & batten! I would like to replicate your sons’ room, especially the display shelf that is created all around the room. I read back through all your posts with regards to the board and batten, but could not find the length or dimensions of the strips of mdf. From the photos you posted, the height of the board and batten is perfect for my daughter’s room. Can you please tell me the length of the mdf, as well as the total height of the board and batten? I was thinking about going 5 feet high. Which means, if I subtract the top strip, the shelf and the crown molding, that should give me the length of the mdf, correct? Thanks! 1) how are the white boards holding onto the paint? We have 2 little guys that are going to be kick jumping off these walls and I want to be certain it’s not going to chip. I didn’t see that you sanded the white boards down or anything. Is the paint staying put? 2) did you find that the boards in the middle stick out a smidge since they’re up against panel while the top piece and bottom piece are fixed directly to the wall? I’m wondering why I don’t see a little bit of overhang in your images cause when we hold up the pieces in our home there is definite overhang! HELP!! Hi Amy, the B&B still looks fabulous, no issues with the paint, I did prime it first, it still looks fantastic. If I understand #2, you mean the vertical battens, and they’re flush with the boards – I filled any gaps or imperfections with caulking. Good luck with your project! Your son’s room is the cutest thing! I was wondering when you nailed the paneling and wood, did you make sure it was hitting a stud? Or did you just nail it wherever? Thanks for your help! HI Jenny, we just nailed it wherever! The walls still look fantastic almost a year later! Hi Julie, I don’t have a photo but I stopped right at the window but you can cut your trim at a 45 degree angle to wrap inside the window frame! Thanks so much for sharing your project – looks fantastic! LOOOOOOOOVE your board and batten tutorials!! You totally inspired me and my super-bumpy-gross walls to cover them up and do it myself too! So I am getting ready to paint…. 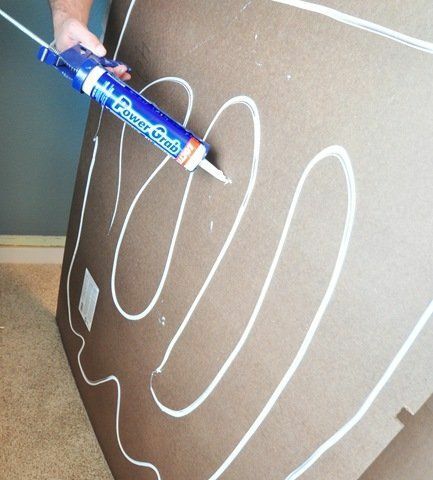 Did you sand your dry erase board before priming? Hi Kate, I have been drooling over this look ever since I found you on Pinterest a year and a half ago! I LOOOOOOOOVE it. Do you have any suggestions for me how I could tackle this to cover a half brick wall? I am unsure how to get a trim board attached to the brick so I could have something sturdy to attach the dry erase board to. I know this is THE answer to updating the 70’s brick that I just cannot take another minute. :) Anyway, any help would be appreciated.